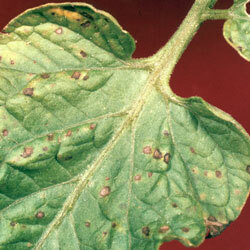 Gray leaf spot tomato disease, which in the U.S. occurs mainly in the southeastern states, exhibits small gray-brown spots on the underside of leaves. Eventually, leaves turn yellow and drop off. Gray leaf spot doesn't directly affect fruit, but damage to foliage will reduce the quality and yield. Small, brownish, circular specks on lower leaves. Sometimes the spots grow together and kill large areas of the leaf. Infected leaves die quickly and drop from the plant. 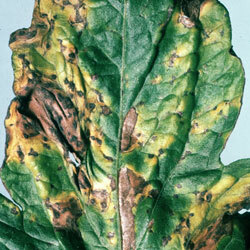 Infections are common in seedbeds or greenhouses when plants are young. Caused by three different fungi of the genus Stemphylium. Fungal spores are spread by the wind, or by splashing water. The fungus survives for a long time on plant debris, weeds, and alternate hosts such as gladiolas. Plant only high quality transplants, discarding any that show any sign of disease or stress. Avoid wetting the leaves when possible by watering the base of the plant. Plant resistant varieties (many are available). No biological control strategies have been discovered yet. Consult the technical references for product recommendations.